Today we have direct access to a vast wealth of information. This means we can become incredibly knowledgeable about almost any subject on our own, and it also means we can easily be misled or overwhelmed by the vast stores of unreliable information and vitriolic opinion available to us. This is why the second step is to LEARN. Learning means actively and intentionally collecting reliable information, paying attention not only to content, but to sourcing! Here again we will first ask you to turn your gaze inward. A primary source of information for all of us is national media in all its forms. But media these days is anything but neutral. So know where your media sources tend to lie on the good info/bad info and ideological bias spectrums. Here is a very useful graphic from Ad Fontes Media (click on the image to go to the interactive version on their site). Find your most common national media sources on the chart. 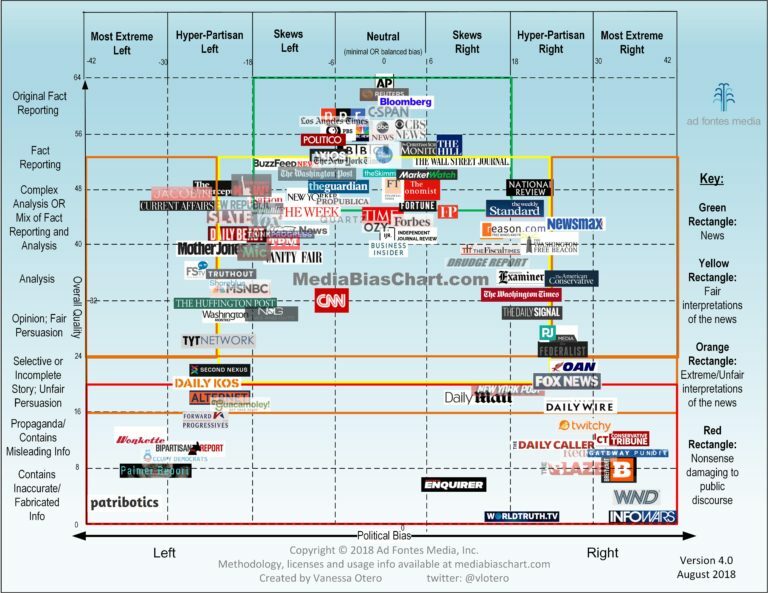 First, are your media sources all above the center line? If not, then those sources are not reliable in terms of the facts they present. Second, do your media sources tend to skew toward the left or right on this chart? If so, consider adding one or two media sources from the other side. If you tend to get your information from social media and things your friends share, then be sure to follow the click trail back to know where they are getting their information. If you are interested in local issues, then the best media sources are still local media. Here is a list of local news sources. Take the next step – LISTEN.